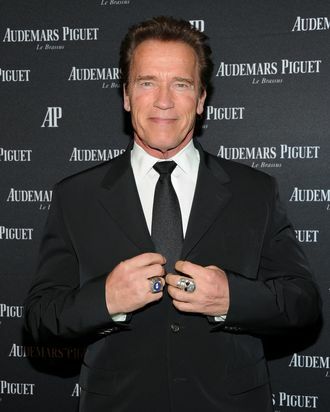 “I’m very happy that the studios want me to be in Terminator 5 and to star as the Terminator, which we start shooting in January,” Arnold Schwarzenegger said in Australia this week, according to a fan site intrepid enough to coax a “Get to the chopper!” out of the man. Schwarzenegger also talked about the Twins sequel and the new Conan movie, saying he’s “very happy” they’re happening and greatly looking forward to both. It’s fun to pretend Arnold spent his entire governorship daydreaming about sequels to eighties movies.